On any given day I probably have 50 things I have to do. Things that I SHOULD get done. That sounds ridiculously impossible and it is. I rarely get everything done. These days I’m more focused on not getting further behind than ever catching up. I’m so far behind sometimes… I think I’m in first place! One of the challenges I’ve faced in the past is managing everything I need to do. Getting things ON my to-do list and then getting them OFF is the objective. I’ve tried pretty much everything from lists on a legal pad to virtually every day planner you can buy at Staples. On the digital side of things I’ve tried Google Docs, Zoho, Nozbe, Priority Matrix, Remember the Milk, Evernote and so many others I can’t even remember! None of them worked very well for me. I was never COMFORTABLE with any of them. And then I stumbled upon Wunderlist. 30 days into using it I think I may have found my long-term solution! 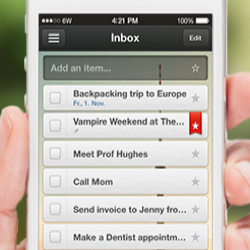 Wunderlist is a simple yet powerful cross-platform, auto-synching, sharable to do list manager. It works on my desktop office PC via the web, it works on my laptop, it works on my iPhone and it works on my iPad. Add something to my Wunderlist on my PC and it synchs automatically and immediately to my iPhone – that’s awesome. You start by putting all your to do items in one place (your inbox), then sort them any way you want into sub-categories (that you can create). You can also set dates and reminders. What works for me might not work for you, but if you’re looking for a better to-do list manager, Wunderlist should be on your to-do list <grin> of apps to try.